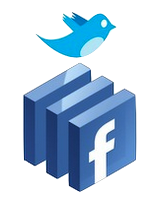 I found the better way to link Twitter and Facebook (which I still have to decide on killing or not) in the Facebook application known as Selective Twitter. Basically when you write your Tweet if you include #fb (at the end by default) it will then appear as your facebook status. Clearly this will make me a much kinder tweeter to my Facebook "friends"
I haven't really written about Twitter at length, so here's a few of my thoughts on the subject just to help you out if you're wondering what the hell it's all about. Large numbers of people don't understand Twitter and I happen to know loads of people who have signed up accounts only to never use them beyond one or two initial tweets. So what the hell is it?? In short, it's one big, massive, enormous, jumbo sized conversation consisting of contributions which are no longer than 140 characters. Simple huh ?.. You might like to think of it as micro-blogging. Very much a quick and instant thought that you put out there. What is genius about it though is the way that conversations can instantly be divided up into sub conversations with use of hash-tags. A hash-tag is a way of labelling a Tweet with it's content. What usually happens is that a bunch of comments on a particular subject tend to attract a relevant hash-tag and before you know it all conversation on the subject is grouped together under that tag. These hash-tags combined with the powerful search facilities of Twitter enable us to easily see what subjects (or even words no associated with hash-tags) are the most popular - and are then referred to as "Trending". So if there are large numbers of posts regarding the "uk election", then you might read a tweet that says "uk election now trending". Actually the UK election picked up the hash tag #ge2010 (which I've referred to elsewhere) and so Tweets about the election were easy to follow by simply searching Twitter for this tag. There's a couple of other features that are worthy of note too. For example "ReTweeting" seen as RT. Retweeting is exactly that - if a user reads someones Tweet and whats to help it Trend then by RT'ing it it just get posted again for everyone to see and of course adds 1 to it's trending count. The user "NickBrowne" has Retweeted the tweet which was originally posted by the user "PAImages". 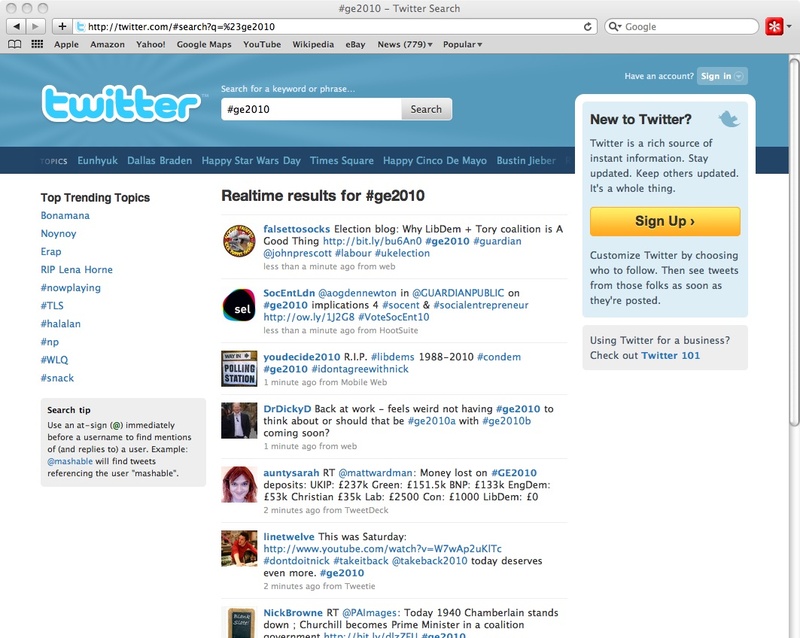 PAImages also included a URL in the tweet which has helpfully been shortened so that it doesn't eat up the 140 character quota, and also added the hash-tag "#ge2010". We can also see that PAImages did this 22 minutes ago and was using the application "TweetDeck" to do it with. See?? It's not as complicated as you think. There's a public timeline which allows you to browse everything that's publicly tweeted. You can see a personal timeline which just shows all your friends tweets. A friend in this instance is defined as someone that you "Follow" although they may not follow you back if they don't want to. Then there's Direct Messaging (or DM). This is just like an email, although still with the 140 character limit and can only take place between twitterers that follow each other. There's a great video (for those of the MTV generation that can't be @rsed to read about it). So that's the basics - but How do you do it ? ?